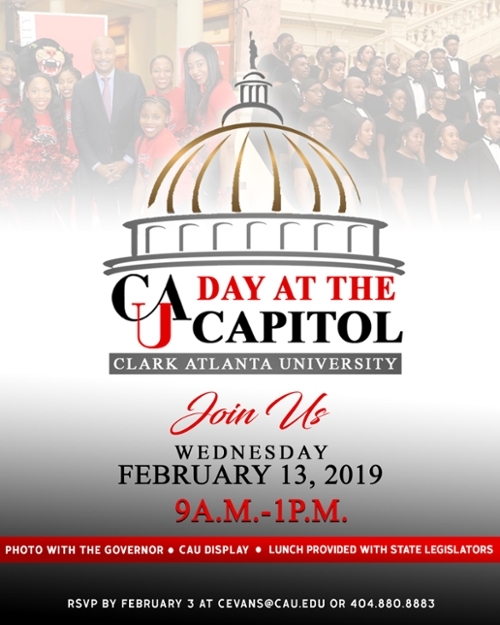 ATLANTA, GA – January 28, 2019 -- Clark Atlanta University announces this year’s CAU Day at the Capitol Wednesday, February 13, 2019. During this spectacular event, CAU interim President Lucille Mauge will be presented with proclamations in the Ga. House and Senate chambers beginning at 10:00 a.m. From 9:30 a.m. to 12:30 p.m on the South Wing steps, CAU will display for state lawmakers our academic offerings from the Schools of Arts and Sciences, Business, Education and Social Work. Legislators will see firsthand the accomplishments of award-winning media CAU-TV and WCLK-FM, learn about groundbreaking research being conducted at the Center for Cancer Research and Therapeutic Development and be exposed to entrepreneurial gains by School of Business students. They will also witness the great strides being made to level the playing field in STEM careers, which are underrepresented by black professionals. In addition to showcasing academic prowess, those in attendance will be entertained by the CAU Jazztet and the CAU Choral. The CAU cheerleaders and Panther mascot will supply the pomp and circumstance in celebration of the beloved historic institution. Lunch will be provided for local lawmakers, alumni and friends of CAU. All alumni, friends and supporters of CAU who work in the Downtown Atlanta area are welcome to join us at the Capitol for this wonderful occasion; if interested, RSVP by February 3rd. For more information on CAU Day at the Capitol and to RSVP, email cevans@cau.edu or call 404.880.6316. Established in 1988 by the consolidation of Atlanta University (1865) and Clark College (1869), Clark Atlanta University (CAU) is one of the Nation’s foremost research institutions, offering students from around the United States and several foreign countries the opportunity to engage in 38 exciting areas of study at bachelors, masters and doctoral levels. Located in the historic heart of Atlanta, one of the world's great international cities, CAU’s nearly 4,000 students enjoy access to academic and co-curricular experiences, from forensic debate, to on-air broadcasting, to cancer research with world-renowned investigators. From the arts to zoology, CAU combines nearly 300 years of tradition with a solid focus on academic excellence to produce leaders who will shape the future of the global community. To learn more about Clark Atlanta University visit www.cau.edu.